Oxtail (occasionally spelled ox tail or ox-tail) is the culinary name for the tail of cattle. Formerly, it referred only to the tail of an ox or steer, a castrated male. An oxtail typically weighs 2 to 4 lbs. (1–1.8 kg) and is skinned and cut into short lengths for sale. Oxtail is a bony, gelatin-rich meat, which is usually slow-cooked as a stew or braised. 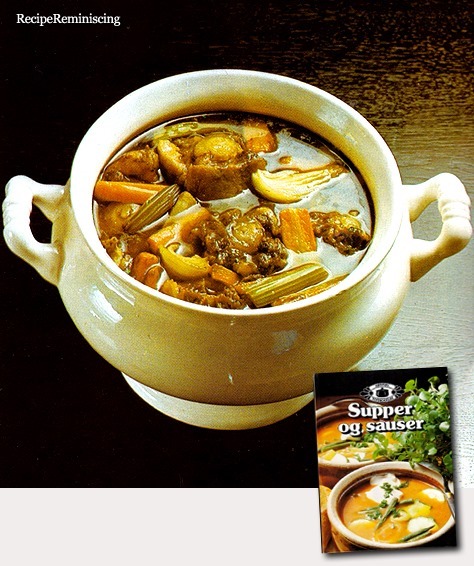 It is a traditional stock base for a soup. Although traditional preparations often involve hours of slow cooking, modern methods usually take a shortcut by utilizing a pressure cooker. Oxtail is the main ingredient of the Italian dish coda alla vaccinara. It is a popular flavour for powder, instant and premade canned soups in the United Kingdom and Ireland. Oxtails are also one of the popular bases for Russian aspic appetizer dishes (холодец or студень), along with pig trotters or ears or cow “knees”, but are the preferred ingredients among Russian Jews because they can be Kosher.